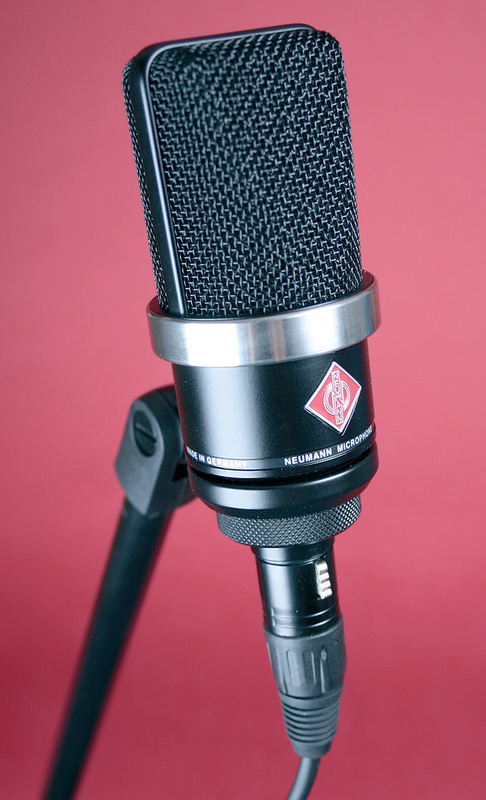 The new TLM102 embodies everything we've come to expect from a large-diaphragm Neumann studio mic — except the price! Unlike some other established microphone manufacturers, Neumann have resisted the urge to produce cheaper models by building them in the Far East, but their TLM range does at least contain some mics that fall into the category of 'affordable' — and these are clearly aimed at the wider project‑studio market as well as professional studio and broadcast applications. The most recent addition to this line, and the most affordable Neumann studio vocal mic yet, is the TLM102 reviewed here. It is a large-diaphragm, transformerless capacitor microphone with a fixed-cardioid polar pattern. Though it looks superficially similar to other Neumann side‑address mics, it is significantly smaller than the likes of the U87. It weighs around 260g, has a diameter of 52mm, and a length of just 116mm. The capsule, with its edge‑terminated diaphragm, makes use of more cost‑effective manufacturing methods than Neumann's high‑end mics, but it has to be said that I couldn't detect any compromises in the microphone's performance. Another cost‑cutting measure is the lack of pad and filter switches, which makes it very much a 'no‑frills' design — but again, this doesn't impinge on the sound quality. Based around a newly developed large‑diaphragm capsule capable of tolerating SPLs up to 144dB (0.5 percent distortion), the TLM102 is suitable for use with loud instruments such as drums, brass instruments and guitar amplifiers, but it was conceived primarily as a vocal microphone, so it's no surprise to see a slight presence lift above 6kHz. This response should add air and intelligibility, and when used as a drum mic, should also help give definition to transients. The capsule, which looks to be a little under one inch in diameter, sits in an elastic suspension mount to help isolate it from case vibrations, while the grille incorporates a dense pop screen, obscuring the view of the capsule. Although the integral pop screen reduces popping from plosives, most singers will still need an external pop shield. Neumann are making the TLM102 available in both black and nickel finishes. The mic comes in simple foam‑lined cardboard box along with a swivel standmount. I had the black model in for review, and thought it very stylish, and beautifully made. A silver band below the basket and the red Neumann logo add a nice visual relief to the black basket and the satin-black body. A thread around the XLR housing locates into the stand adaptor to provide a secure support, and the Neumann logo denotes the 'hot' side of the capsule. However, the thread will fit other Neumann‑compatible shockmounts. The frequency range of the TLM102 extends from 20Hz to 20kHz (‑3dB) and is nominally flat up to 6kHz before that gentle presence rise kicks in. It has a very respectable sensitivity of 11mV/Pa at 1kHz into a 1kΩ load, with an equivalent input noise level (A‑weighted) of 12dBA. Expressed as a signal‑to‑noise ratio (A‑weighted relative to 94dB SPL), the figure is specified as 82dB. While there are quieter mics of this type, this is still a reasonably low noise figure and should cause no problems in typical applications — most of which will involve either close or loud sound sources. A standard 48V phantom power source is required. Spoken-word tests reveal a lot about studio microphones, and the TLM102 immediately sounded well‑balanced in this application, without me having applied any EQ. The effect of the presence lift is quite subtle, opening out the sound slightly, but at the same time the mids and lows seem perfectly integrated, creating a sense of clarity and closeness. I set up some relatively inexpensive (but nevertheless reputable) side‑address mics for comparison and found them to sound either slightly 'spongy' or a touch nasal by comparison. With sung vocals, the TLM102 exuded the kind of sonic class normally associated with much higher‑priced studio mics, pushing the vocals to the front yet still allowing them to breathe. The TLM102 also did a workmanlike job when I used it on acoustic guitar, and while it might not have conveyed quite as much body depth as some of the mics I normally use for this purpose, it managed to deliver a bright and lively sound that was also smooth (some mics tend to make the string attack sound too gritty). Where you're recording an acoustic guitar to sit in with a pop mix, this mic does the job well and with ease. For solo work you may have to experiment with the position a bit more to balance the highs and lows, but again, this isn't a problem. Further tests with hand percussion produced perfectly usable results, although there was less difference between the TLM102 and some of my budget standbys in this application. I was very pleasantly surprised, however, when I put the mic up in front of my guitar amp, just off‑axis: it came extremely close to giving me the sound I was hearing in the room, with all the jangle and bite of the amp but no harsh edges. This shows the real versatility of this mic, because I'm not generally a fan of capacitor mics for recording guitar amps. At this price, the TLM102 isn't going to be fighting it out with the armies of budget mics that seem to have flooded the market in recent years — but then it isn't unduly expensive either, especially for a Neumann. It may not have all the frills of some of Neumann's upmarket mics, or the free shockmounts and camera cases of many Chinese‑manufactured mics, but it holds its own sonically, and it wouldn't be disgraced in the presence of its costlier siblings. I'd certainly be happy to make this my go‑to vocal mic — unless I specifically needed something with a more overt character to suit a particular voice — and for those project-studio owners who want just a single decent mic that can tackle a variety of sources as well as vocals, this should prove a very practical choice. It's hard to pick a direct alternative as there are so many medium- and large-diaphragm side‑address mics to choose from, all with different sonic signatures. The Audio Technica AT4033a is one possible contender, and offers similarly impressive results on guitar amps, but there are models worth consideration by manufacturers such as SE Electronics, Rode, Blue and many others at this price. A lovely vocal mic that also seems to manage just about anything else you throw at it. Affordable — for a Neumann. No storage case other than the cardboard box it comes in. This may be Neumann's least expensive mic of this type, but there's nothing about the sound that says 'budget'. Most people will use it as a vocal mic, but the excellent results I achieved using it on my guitar amp came as a pleasant surprise. Sennheiser +44 (0)1494 551 551. Neumann USA +1 (860) 434‑9190.